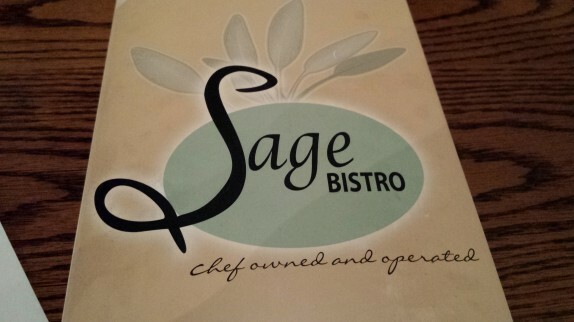 I decided to stop back at Sage Bistro for lunch on a Saturday. Being that it’s a restaurant so close to work and home, I was eager to see how the experience was for lunch. 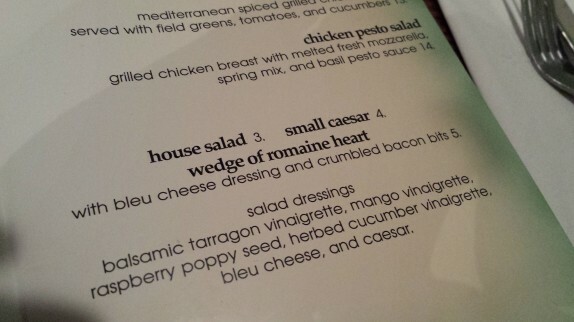 Mainly, I wanted a falafel wrap (Falafel croquets, hummus, lettuce, cucumber and tomato – $8) with fries, but I saw a wedge of romaine heart salad (With bleu cheese and crumbled bacon bits – $5) that caught my eye. In past visits, I had been fond of the blue cheese there, so it sounded good. The salad arrived first, and it was very pleasing. The blue cheese hadn’t changed and was creamy and ever so pungent. 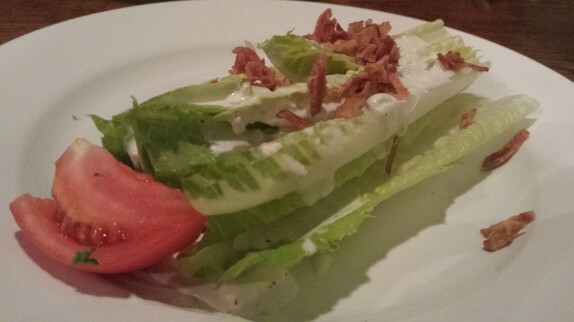 The romaine was crisp and very loosely bound so the blue cheese could permeate between leaves. The bacon bits added some chew and smokiness. The tomato didn’t add much flavor, but it did help to bring some texture. 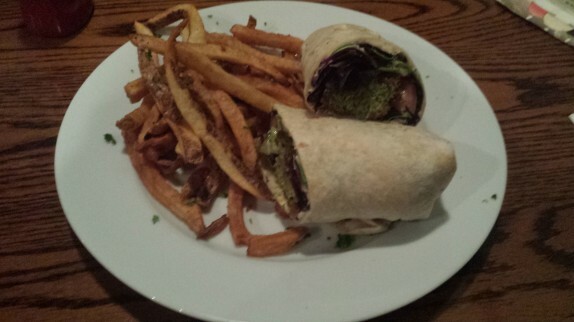 The falafel wrap was also pretty good. 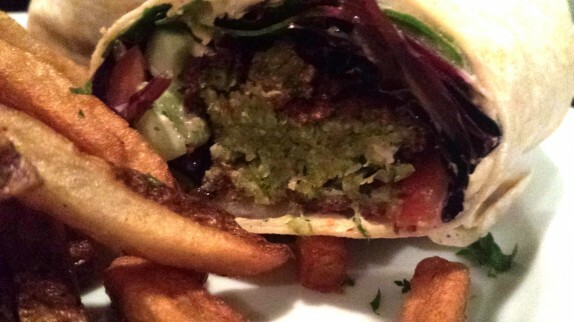 They’re a little literal with the presentation; it’s falafel in a flour wrap. I had expected a more traditional presentation wrapped in pita. 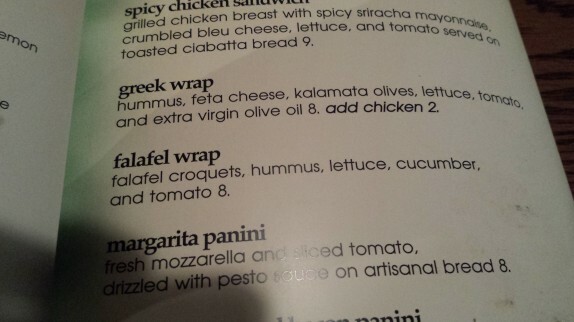 Though the hummus inside of the wrap was good, I would have rather had more tahini sauce, which was very good and ubiquitous for this style of sandwich. The mixture of lettuce, cucumber, and tomato was good, but it was missing the bite of pickled vegetables one associates with a falafel wrap. The fries (clearly homemade) were outstanding. This dish is certainly filling and a great value for $8. There are a number of other menu items (like the bleu burger [Half pound chargrilled angus hamburger with bleu cheese crumbles, fried onion, and steak fries – $9] that I’m eager to try for lunch. I have a question and I wonder how different you feel when you’re judging your food and taking pics as opposed to just going in and enjoying the food…are you in a work mode or what when you Derry X a cafe? When I go out to eat, aside from taking a few pictures, I’m enjoying myself. Generally, I keep my opinions to myself unless the conversation moves toward how the meal is. Usually, though, I like to just gather a few thoughts as I eat then sit down and think about it when I’m ready to write about it. The pictures help me to jog my memory in case I can’t get back to writing about it quickly. When I’m judging (like the pizza tournament http://derryx.com/1/how-i-judge-pizza/ ) that’s a little different. I’m there to give a critical assessment of what’s in front of me. On a day-to-day basis though, I’m just having a meal. It’s funny because I was just telling someone about how I was at a dinner for work, and people kept looking at me to see if they could tell that I’m being picky about the food. They laughed when I told them I just like to enjoy my meals the way they do. I’ve eaten food with people who will inspect everything, swoosh bites around their mouth, and do other annoying/pretentious things to make it seem like they know what they’re talking about. That’s not my style. You are reading my mind! I have been craving falafel. Finally went to Pepper Jacks last night to get one and it was really good. Hit Trader Joes today for their frozen ones (not so great – but at least I can add whatever I want to my wrap. Now I read this and need to try Sage and I’m kicking myself for jackassing around albany when Sage is literally around the corner from me! Thanks!